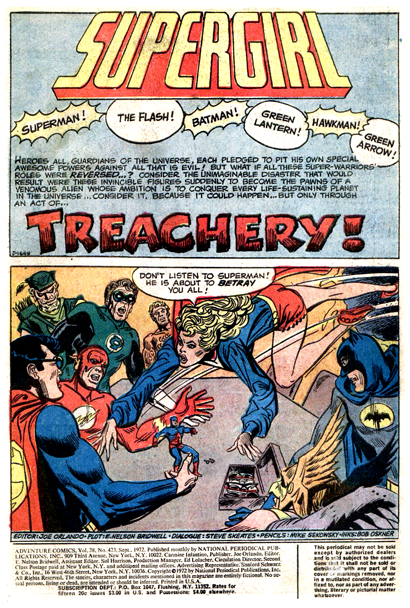 "Treachery!" by E.Nelson Bridwell, Steve Skeates, Mike Sekowsky, and Bob Oksner. 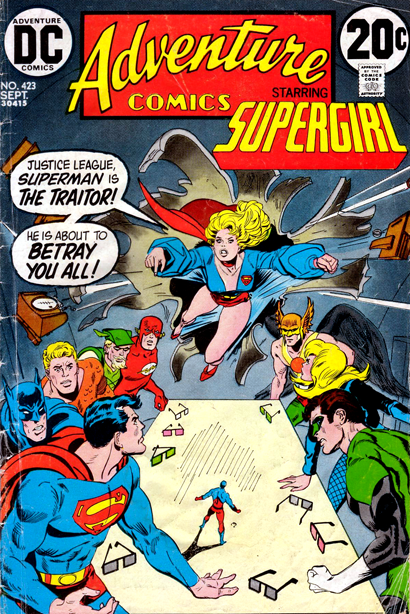 In this Supergirl adventure, the Justice League--including Aquaman--make a guest appearance, drawn by their original artist no less! Young Linda Danvers goes shopping for swimsuit, but a too-friendly saleslady insists she try these new "mod" sunglasses, going to far as to slapping them on Linda's face. Linda is dismayed to learn that, once applied, she cannot get them off, even using her super powers! Little does she know these mysterious sunglasses are the work of two green-skinned aliens, who have been monitoring Supergirl from afar. Suddenly, a construction-site crane snaps in two, threatening to crush some people. 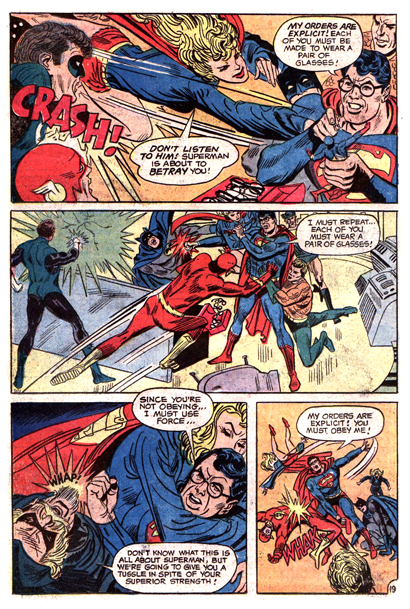 Linda changes into Supergirl, saving their lives. Then she receives a "message" from the glasses, one she feels she cannot disobey! Next, we find Linda visiting her cousin Kal in the offices of The Daily Planet. While his back is turned, she switches his glasses, and when he puts them on, finds he, too, is now a slave of these alien masters! Back on Earth, the two head aliens--who are brothers--turn on one another when it's revealed one of them decided to help Supergirl free herself of their mental grip. As they blast holes in their ship, they order their underlings off so they don't go down with it. 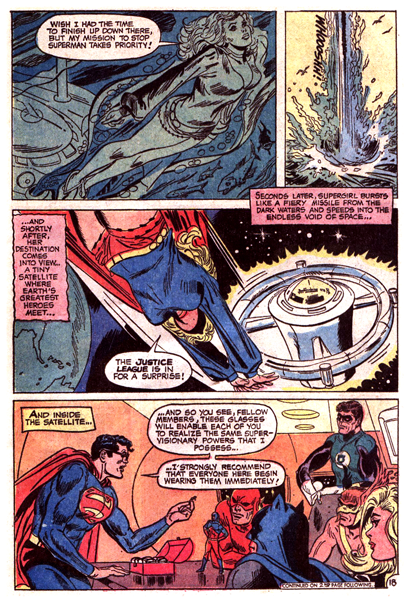 Later, Superman and Supergirl investigate, and the Maid of Might describes it as "one of the eeriest scenes I've ever witnessed"--the two men sitting their, in the darkness, dead. Supergirl and Superman then decide to build the stranded aliens a new spaceship so they can return to their home planet--no harm, no foul. The End! F.O.A.M.er Russell Burbage reminded me of this story the other day, and I was sure I had covered it here on the Shrine before. But other than using it for one Random Panel of the Day, I had managed to let this one slip by. Which is ridiculous, since it features Aquaman and the Justice League, written by the great Steve Skeates and drawn by Mike Sekowksy! What the what! On the Aquaman front, I'm glad he's the one who formulates the game plan to take Superman down. There's no "I" in "TEAM"! A truly fun story, it was a pleasure to read. Thanks for the reminder Russell! Wow, just wow. I have great respect for Mike Sekowsky, but man, this art is ROUGH. Seeing his art without the application of the Silver Age House Style in the inking department is quite shocking. Green Lantern, Green Arrow and Batman are particularly off model in most panels. I do dig the kinetic energy, and few artists could cram so many characters into a panel with such ease as Sekowsky, but the art seems very, VERY rushed. The plot is nuts. 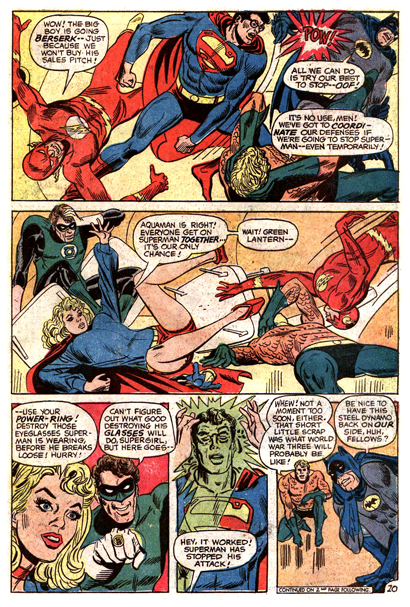 Another one of those arguments for DC not ever completely entering the Bronze Age, at least by the early 70s.